It had been a fantastic morning. The four of us had been skiing with our guide and his wife off the Aiguille du Midi above Chamonix, carving perfect tracks through virgin slopes. We stopped to rest above yet another open snow field and to admire the view. “I’ll go first, wait, and then one at a time” our guide instructed and set off down the slope. Turn, turn, turn, and then suddenly, with absolutely no warning he disappeared. Simply vanished. All that was left was his hat on the snow. It took a moment to realise that the hat was still on his head. He had broken a snow bridge across a crevasse and was balanced over the abyss with his shoulders pushed against one side and his skis the other. If you’ve read Taleb’s book “The Black Swan” you’ll be familiar with the idea of a highly improbable event, which is unpredictable, having a massive impact, and that we try to make it appear less random and more predictable than it was. We just love predictability, don’t we? Do we heed the warning associated with all financial products; “past performance is no indicator of future success”? No, we just presume that the opposite will probably be true. Or at least we did, until the latest “credit crunch” hit us and we all became painfully aware that our tomorrows were going to be quite unlike our yesterdays. We do the same thing with our business plans. Despite the fact that most of us can’t predict how today will pan out, we happily write business plans with 5 year projections based on historical evidence, as though the history of business follows some scientific theory. In doing so we are not just ignoring Taleb, but more importantly, Popper. In The Poverty of Historicism Karl Popper criticised the idea that “an approach to the social sciences which assumes that historical prediction is their principal aim…” The social sciences, he notes, are quite unlike the physical sciences as “the human factor is the ultimately uncertain and wayward element in social life” and that human factor holds sway over the outcome of social and historical events. So what of that great fictional genre; the business plan? I think that the business plan has a really important role to play in planning and managing a business, just not in the way that it is usually used. A good business plan should be explicit about all the assumptions that you are taking. It should make the logic of your forecasts clear and open to future scrutiny. Next a business plan needs to be a living document which you come back to regularly. Then you can measure your own experience and the current circumstances against the assumptions that you made. You can then make an intelligent guess about what might happen next and most importantly, adapt your strategy. Because, if we truly cannot see into the future we should act appropriately, moving forward with hands outstretched, and be prepared to react to circumstances as we discover them. Don’t even fool yourself into thinking that you can predict the consequences of your own actions (we’ll save The Law of Unintended Consequences for another time). Our skiing event was fortunately not a Black Swan because we had predicted that at some point skiing in that region we may fall down a hidden crevasse or be swept away by an avalanche. Because we had accepted that it was a possibility, we had prepared for it and practised our response. 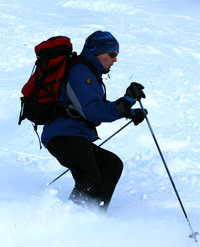 We wore harnesses and carried ropes, shovels, probes and avalanche transceivers. Within a few minutes the guide as safely out and we were left with nothing more than a great story for the bar that evening. “We have become makers of our fate when we have ceased to pose as its prophets.” Karl Popper. This entry was posted in imagine and tagged commercial, funding, theory. Bookmark the permalink.